The 1st thing to do is check for wear in the aluminum caps. New caps measure .380″ ID. Get new ones or drill to 13/32″ and loctite (red) in a sleeve of .375″ ID .015″ wall K&S brass tubing (available at hobby shops). Clearance must be tight or you won’t have enough rebound damping. If you have these type of damp tubes then its easy to cover the holes below the conical section with JS alum sleeves and drill only one 1/16″ diameter hole in the middle of the conical section (below right). This will give you some compression damping. The stock setup offers no compression damping whatsoever. You don’t want too much or you will get a harsh ride. One 1/16″ hole in each tube works out just right. If you have damper tubes with holes in the conical section. Silver solder a couple brass plugs into the holes. Be careful not to insert the plugs so deep that they interfere with the damper rods (you should not be able to see them on the inside). Smooth them off and drill one of the plugs with a 1/16″ drill bit. There must be no other exposed holes. To avoid leaks, open the ID of the fiber washer that locates at the bottom of the dampner tube to .655″ Drop the washer in place at the bottom of the alum slider. 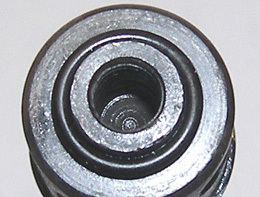 Place a 5/8” OD x ½” ID x 1/16” Oring on the bottom of the damper tube. 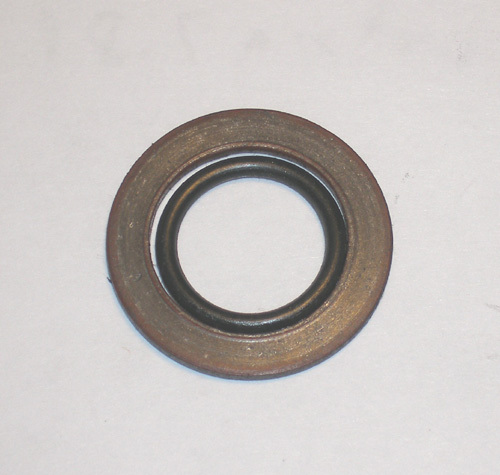 You must have the fiber washer installed in the slider as described above to avoid crushing the Oring. To prevent leaks at the drains. 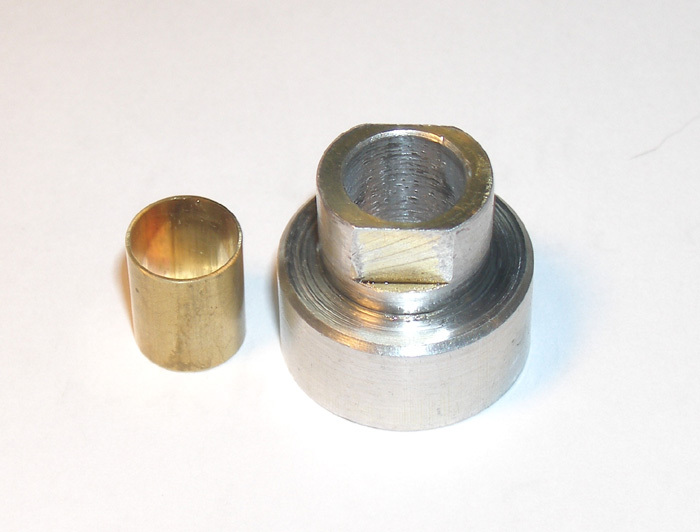 Make a brass washer with .4” OD x .312” Id x .050’ thick. Install an Oring with 3/16” ID x 5/16 OD x 1/16” thick. For your forks to ride smoothly with out bottoming or topping out you must install the slippery JS Turcite bushings along with the aluminum sleeves. 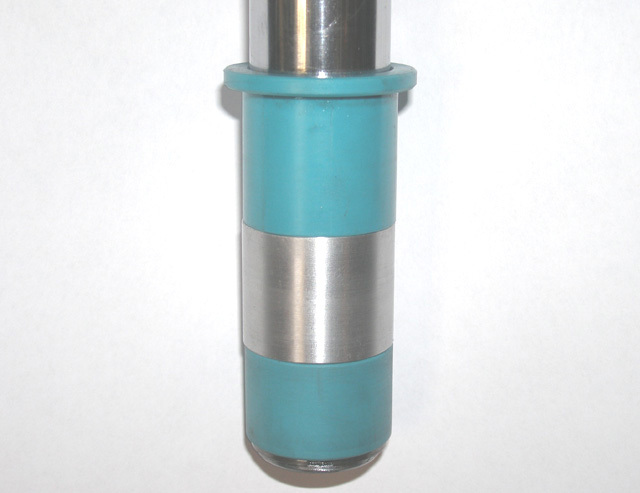 Plug the 1/8” diameter oil escape hole in the bottom of the fork tube (just above the lower bushing) or you will not get the necessary oil cushion to prevent “top out”. 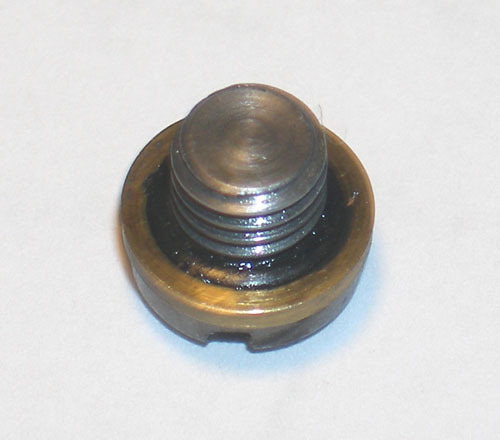 Thread the 1/8” hole with a 6-32 tap and use the provided set screws (coat the threads with JB weld epoxy or red loctite to keep them in place). Make sure the set screws are not proud of the surface or installed too deeply. Use 15 or 20 weight fork oil and stock fork seals (not leak proof seals). Now you’ve got oil tight, modernized, stickion free forks with improved rebound and compression dampening.